Originally posted by nikitagretzky at что вы вы видите на этой картинке? Получилось что "митрополит согласен с нацистами" ? Object of the week number one! Hi, I'm new in this comm, although I've been lurking a while. I just started my own wunderkammer, and I'm mainly collecting objets de mystere - I thought it'd be fun to throw a few at you guys and see if you could identify them, partly because I have a few that I can't identify right now, and neither can anyone I've tried. Seriously, I might be giving prizes for those ones. But I'm starting with a pretty easy one, no prizes for this one, I know what this is. I'll give clues if you ask! Also, I apologize for my photography skills. I badly need a tripod. The answer is MASKS! What's the Blump without masks? I used to collect them like crazy and the Blump was full of masks I made myself. This sounds like a possible _wunderkammer_ project to so I will post this idea in both places so feel free to add a mask to this wall if you want to. Look What I Made the Other NIght!!! Because I'm Bored and I Can't Sleep!!! The other day the computer game "Roller Coaster Tycoon" came free with my breakfast cereal but I still haven't played it yet. I don't usually play video games anyway, but the idea of designing my own amusement rides appeals to me. I've thought it would be fun to create a program that allows users to design their own CAROUSEL, but it might be kind of complex, especially if you want to decorate your own horses and animals like I do. 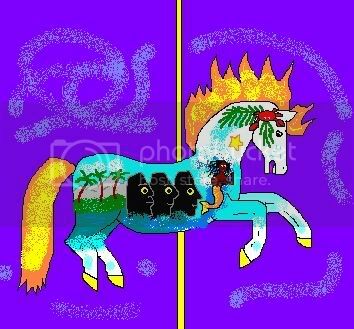 In my website, http://margaretfranklin.com I have a colouring book customers can order with plain carousel horses you can decorate yourself using pencil crayon, markers, stickers, etc. I've even used some of these designs in my own embroidery, using the basic master carvers' body shapes but my own trappings such as lilacs, sunflowers, etc. THe _ewetopia_ sheep have doen it again, along with some help from their friends at lifewithlouella!! Instead of just RENTING a hall for Olive and Lester's upcoming wedding reception, who else would be resourceful/crazy enough to find a gronky old abandonned place and fix it up themselves!!!!!!!!!! !